When following all the modules the year covers the anatomy of the horse with emphasis on the horses head, mouth, tmj and hyoid, common dental pathologies, assessing the horse as a whole , assessing the mouth, bitfitting: pro's and cons of other shapes and kinds of bits, biomechanics of the horse, compensation patterns, tongue problems and other bit and body related issues, bridle fitting, osteopathic insights and more. Want to be informed or start right away? Please contact us. This year it is possible to follow training Online !! Interested in bits and horses? klik on the magazine below to read it. 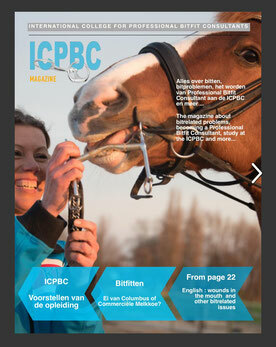 ICPBC magazine is partly English, partly Dutch.